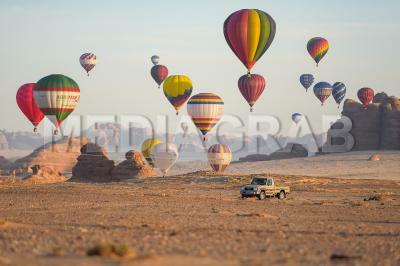 Al-Ula, Saudi Arabia – February 1st-9th, 2019: A Stunning Festival of Night-time Hot Air Ballooning - sixty hot air balloons took to the sky in the region’s first Hot Air Balloon Festival offering rides to festival goers and locals alike. Al-Ula, Saudi Arabia – February 2, 2019: On Friday, world-renowned opera singer Andrea Bocelli presented a grand artistic performance at Maraya Concert Hall as part of Winter at Tantora Festival, which was recently launched by the Royal Commission for Al-Ula. The Festival features a variety of heritage, cultural and artistic events inspired by the heritage of Al-Ula, which dates back thousands of years. 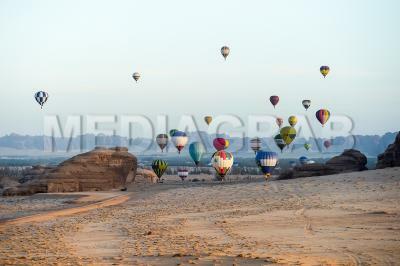 It attracted a wide audience from different regions of the Kingdom and beyond. Described as having the most beautiful voice in the world, Bocelli presented a concert that reflected the splendor of his majestic voice, which inspired millions around the world. Soon after his birth, Bocelli was diagnosed with congenital glaucoma, which made him partially blind. He then lost his vision completely at the age 12, after he was hit on the head during a game of football. He participated in several musical competitions and recorded his first album in 1994 in Italy. He made great success in Europe shortly after his album "Bocelli" was released. In addition, he participated in collective and cooperative works with a number of international artists and musicians, and released many albums. Bocelli was awarded the Order of Merit of the Italian Republic. He received Grammy nominations for Best New Artist in 1999, for Best Sound Performance for Sogno in 2000, and for best vocal collaboration for The Prayer. Maraya can accommodate up to 500 guests. It includes a private VIP area, a gallery for world-class artists, such as Dutch artist Vincent Van Gogh, a reception area and artists rooms. Architect Massimo Fogliati, and the Italian designer Florian Buji of Geo Forma Studio designed the building that takes the shape of a huge cube covered with mirrors from its four sides to reflect the beauty of surrounding nature and the curiosity of man throughout history to explore the dazzling landscapes. Maraya will not rival the beauty of Al-Ula, but rather will reflect and highlight it while offering a unique experience for guests to unite with the pristine environment around them. On weekends, Maraya Concert Hall will host concerts by world-renowned artists who made their mark in the field of Arab and international art. The first night of the Festival will feature a concert by the Arab artist Mohamed Abdo. The following concerts will include the Arab artist Majida El Roumi, the Arab artist Um Kulthum via hologram, the musician Omar Khairat, the Italian singer Andrea Bocelli, the Greek composer Yanni, the French violinist Renauld Capuçon and the Chinese pianist Lang Lang. They will dazzle the audience with their impressive performance and artistic sense. AlUla, Saudi Arabia – 27 Jumada AlAwal 1440 AH, corresponding to 2 February 2019: Held under the patronage of his Royal Highness Prince Muhammad Bin Salman Bin Abdulaziz, Crown Prince, Chairman of the Royal Commission for AlUla, His Royal Highness Prince Faisal bin Salman bin Abdulaziz Al Saud, Governor of Medinah AlMunawarah Province, awarded the winners of the Custodian of the Two Holy Mosques Endurance Cup, which concluded today in Fursan village in AlUla with the presence of His Highness Prince Bader bin Abdullah bin Farhan Al Saud, the governor of the Royal Commission for AlUla. The race was also attended by the Chairman of the Saudi Equestrian Federation, his Royal Highness Prince Abdallah bin Fahd bin Abdallah and Engineer Amr AlMadani, CEO of the Royal Commission for AlUla, as part of the Commission’s ongoing efforts to strengthen AlUla’s position as an exceptional tourist destination boasting a unique heritage rich in arts, culture and sports. At the end of the race, his Royal Highness Prince Faisal bin Salman bin Abdulaziz Al Saud, Governor of Madinah AlMunawarah Province presented the cup to the owner of Blakeridge Indigo who completed the race in 4 hours 25 minutes 43 seconds, in the presence of His Highness Prince Bader bin Abdullah bin Farhan Al Saud, the Governor of the Royal Commission for AlUla and His Highness Prince Abdallah bin Fahd bin Abdallah, Chairman of the Saudi Equestrian Federation. His Royal Highness Prince Faisal lauded the efforts of the Royal Commission for AlUla and the Saudi Equestrian Federation teams as well as the Emirates Equestrian Federation for the organization of the event and the great support they provided to the participants. His Highness Prince Bader bin Abdullah bin Farhan Al Saud, the Governor of the Royal Commission for AlUla, said: “The history of AlUla bears a lot of inscriptions that highlight the population’s interest in Arabian horses, which makes AlUla the perfect location for the launch of the prestigious Custodian of the Two Holy Mosques Endurance Cup, the biggest prize of its kind in the world, with the full support and close supervision from His Royal Highness Prince Mohammad bin Salman, Crown Prince and Chairman of the Royal Commission for AlUla. We are happy to see the huge efforts of the residents of AlUla as we seek to provide more job opportunities to its youth through the organization of different events and activities.” The Governor of the Royal Commission for AlUla congratulated the competitors and Salem Hamad AlKutbi from M7 Endurance stables on his win. The race was part of the Winter at Tantora festival in AlUla held in partnership with the Saudi Equestrian Federation and the Emirati Equestrian Federation to highlight the heritage of AlUla that goes back thousands of years. The riders competed for a prize pot of 15 million SAR (4m USD). Through Winter at Tantora, The Royal Commission for AlUla aims to promote the position and archaeological history of the city as an international tourist destination, and to eventually attract more investments and provide job opportunities to the young generation in AlUla. Other: Winter at Tantora Festival is held in Al-Ula, Saudi Arabia from December 20, 2018 to February 23, 2019. It includes heritage, cultural and artistic activities inspired by the heritage of Al-Ula, the home of important heritage sites in the north of the Arabian Peninsula and is the meeting point of many civilizations throughout the ages. Every weekend, the Festival will host artistic events and concerts by world-renowned artists who made their mark in the field of Arab and international art.